Litholyte reviews. So what exactly is Litholyte? It is a dietary supplement designed to improve kidney health by raising a person’s urinary citrate. Litholyte achieves its purpose by harnessing the combined power of bicarbonate and citrate – its two main ingredients, according to the manufacturer. Low urinary citrate levels have been linked to declining kidney health. So the supplement strengthens the body’s mechanisms for correcting citrate levels. Litholyte capsules supply the body with a key ingredient called potassium citrate, which is said to enhance kidney function. Now this Litholyte review helps us understand the claims whether potassium citrate dissolves kidney stones, (it being the major ingredient); as well as other features and aspects of this supplement. So Does Potassium Citrate Dissolve Kidney Stones? The answer to this question is an obvious yes. The manufacturer of Litholyte purports that this product is formulated to help boost citrate levels in the body. This in returns dissolves calcium oxalate crystals, which are said to form over 80 percent of kidney stones, qualities that that several other supplements claim to offer. The producer claims, just changing the diet is not enough to supply the required dietary citrate amount into the body. To be exact, taking citrus juice, which is much higher in the component than ordinary foods – one needs to consume over 1000ml per day. However, anyone taking potassium citrate kidney stones or Lytholyte is at an advantage because they get all the citrate compressed in the daily capsule dosage. Who is the Manufacturer of Litholyte Citrate + Bicarbonate? Litholyte 10 mEq is the product of a company called Litholyte. They are a US-based corporation and claims are that the product as well all its ingredients are manufactured in, and follow US’s strict measures of safety. The producer states on their professional website that Litholyte doesn’t need a prescription. However, your doctor may want to monitor the supplement to ensure it works for you – so it’s generally wise to make him/her aware of you using this stuff. How Does Litholyte Citrate + Bicarbonate Work? Again, the supplement is said to combine the power of two ingredients, bicarbonate and citrate, which ends up raising the level of natural citrate in the user’s body. The manufacturer says their research is clear on the fact that decreased urinary citrate levels, a situation called (hypocitraturia), translates to decreasing kidney health, hence the need to raise citrate levels. Now, this dietary surplus is specially formulated to help the body correct it’s citrate levels, to bring it to normal range, which in consequence promotes kidney health. The stuff goes to work as soon as it lands into the user’s system, making it one of the few supplements you can expect results within a few days of use – it’s working. Litholyte Citrate + Bicarbonate Ingredients – Are they Safe & Effective? Unlike before, there has been a rise in supplements that are meant to help boost kidney health. Most of them have been said to work quite well with zero or minimal side effects because they are particularly designed to deliver a solution. Litholyte to be precise is said to be produced under approved cGMP guidelines, a body that monitors how dietary supplements are made, if the facility they are manufactured under adheres to standards etc., to ensure safety. Potassium Citrate – associated with several health benefits including, balanced blood pressure, reduced risk of stroke, improved bone health, as well as linked with the property of dissolving kidney stones. Plenteous intake of potassium citrate has also been seen to reduce mortality rate up to 20 percent. Sodium bicarbonate – said to help ease urinary tract infections and boost kidney function. It also plays the role of a natural antacid and neutralizing agent in the body. Magnesium citrate – purported to support energy production at the cellular level, boosts bone health and muscle quality, helps the body balance sugar levels among others – with the related aspect to this point being helping the body do detoxification well. Erythritol – said to offer the benefits of being an organic and natural sweetener, sugar-free, good for mineral balance in the body and other minute health benefits. What are the Advantages of Litholyte Citrate + Bicarbonate? It is said to be much stronger in delivering its promise, more than Chanca Piedra and potassium citrate 99mg. Has literary no calories, so users need not to fear the claims that using it adds calories in the body. It’s US-made so users can expect quality and safety from the product. People with flavor and taste sensitivity in supplements can use it because it is tasteless, and with zero flavors added. What are the Disadvantages of Litholyte Citrate + Bicarbonate? The product claims to raise citrate levels but doesn’t indicate to what percentage. Taking one pack contains only 60 stick so users may have to purchase at least 2 packs to avoid running out of supply anytime soon. As in, one pack is hardly enough to keep you long enough. Users who order in bulk may see different packaging of the product than what’s seen in the single pack. The product is not intended for use by pediatric patients, nursing mother or during pregnancy. 1 Q. How to Take Litholyte Citrate + Bicarbonate? Asn. The manufacturer advised placing an order of 2 pack per time to last you longer – one pack is still okay, however. Whichever the case, mix one or two sticks in a 500ml or 16.9 water, or as directed by your medical practitioner – can be taken anytime, in the morning or before bedtime. 2 Q. How Much Does Litholyte Citrate + Bicarbonate Cost? Ans. One packet of Litholyte, which contains 60 stick filled with citrate, bicarbonate and two other ingredients as mention in the ingredients section costs around $32, again, it’s recommended to at least order 2 packs at $58 to avoid running out of supply earlier than expected. 3 Q. Where to buy Litholyte Citrate + Bicarbonate? Litholyte is becoming a well-known kidney supplement and a good place to order it is online –here, on this website due to timely delivery. 4 Q. What is Litholyte Citrate + Bicarbonate’s Return Policy? Ans. The producer is clear that users can return the product if unsatisfied, and the refund will be granted right away. However, they have not specified how soon one needs to return the product – so users can ask to confirm the accepted period specificity to keep within the bracket if any. 5 Q. 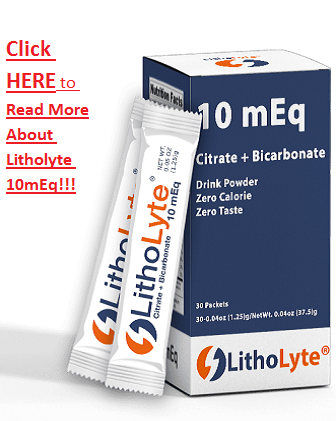 Does Litholyte Citrate + Bicarbonate Offer Free Trials for their Product? Ans. As a company, Litholyte doesn’t mention whether they have a budget for trial samples for this product. Nonetheless, aspiring users can fill out a contact form provided on the official website to ask more about trial offer possibilities. 6 Q. Does Litholyte Citrate + Bicarbonate Work? Ans. There is evidence by users as well as doctors that this kidney health supplement works, just like many other products in the market. Ans. To avoid unwanted effects users are advised to steer-clear the product if they are pregnant, pediatric, nursing or facing chronic renal failure. In precise it’s highly advised to first get approval from your doctor in case you are suffering from any condition that you are not sure if your safety could be compromised, or when anything seems like litholyte’s side effects on you. Litholyte is designed to improve and help the body sustain healthy kidney function. The take and notion are that there are lots of things that make us want to detox the kidney as well as other organs in our body. That’s why products like ckls, kidney COP, and other supplements which focus on detoxification and helping to keep healthy kidneys exist. So with regard to the product’s relevancy, Litholyte is a great product to the people it works for. However, folks with problems taking potassium citrate, spironolactone, amiloride and so on would need to first get direction from their doctor before engaging this kidney dietary supplement. Top on that, although not a downside as such, users who consider using Litholyte for a prolonged length of time need to order at more than one pack to avoid having to re-order all the time. Otherwise, the manufacturer claims that they have seen many positive results from users, and are confident that Litholyte Citrate + Bicarbonate works well in maintaining proper kidney function. “I think this stuff provides a simple way of boosting urinary citrate for me. I was told high levels of citrate inhibits the formation of calcium oxalate stones as well as dissolve kidney stones, now my results are slowly proving the same. I’ll be ordering the next set of packs anytime. “Good stuff. I like it and I’ve seen great change but it’s a bit high in price –anyway it’s worth. However, I intend to be using it intermittently, in the sense that I’d use it 3 months, skip a month, again 3 months, kip, and so on coz, my aim is just to keep the potassium citrate levels to per – not essentially using as medicine because I’m not sick. I keep the idea – protection is better than cure.